Accutronics' roots date back to 1984, when Luis Pedroso founded Qualitronics, in Lowell, MA. 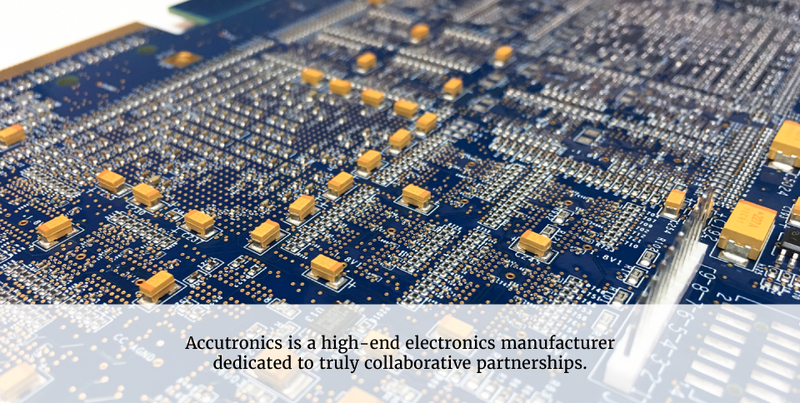 Managed from a start-up to a 160-employee company, Qualitronics was acquired by MSL in 2000. Accutronics was born shortly thereafter, in 2004. Today, Accutronics resides in a newly renovated 31,000 sq. ft. facility located in Chelmsford, MA, and consists of nearly 100 dedicated employees. If you're looking for speed, precision and flexibility for your next project, Accutronics has two FUJI high-speed, high-precision SMT lines dedicated to NPI, and three separate FUJI SMT lines dedicated to run production. Along with two PARMI 3D AOI systems, two DAGE X-Rays and a TAKAYA flying probe station, Accutronics can offer lower upfront tooling costs on rapid prototype and small production builds. Glen Thomas, Director of Operations at SANBlaze Technology, Inc. Your request was successful. You will receive an e-mail confirmation shortly. Thank you!